I make comedy animations and cool remixes, recently about a dude named Xavier. Check out my stuff if you follow me! I have joined this account since November 10, 2017. Announcement: I will make my first edition of Ask Xavier. When I reach 130 projects, I will begin Season Two. I also do Tinkercad coding at my school and I'll be studying amateur radio in the future. 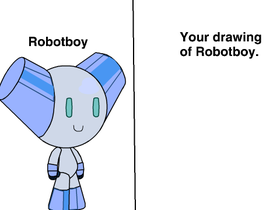 Make your drawing of Robotboy.